Part of the American dream is to own a home and be able to provide for a family. Family means a partner or spouse, kids, dog, and a number of in-laws you also seem to have married. A man and woman’s first dream is of course to find each other. Did you know that opposites attract? We’ve all heard that before and indeed it does seem to work out that way most of the time. There are many opposites that can be between a man and woman, and all not just emotional or personality wise. Physical or chemical makeup can also be opposing forces that attract each other. Regardless of the psychology or scientific reasoning for it all, it just simply remains true…opposites attract. So it should be no surprise to us when our significant other is too cold when we are hot or too hot when we are cold or just fine. That’s how the thermostat wars begin in our homes. Thermostat wars can cause serious issues in a relationship and in our comfort and quality of home life. Wink-wink, but you know it is true. You see, we all want to please our spouse or significant other, but sometimes when it becomes a choice between our own comfort and theirs, we are somewhat jaded in our decision and we often selfishly choose our own well-being over theirs. So, we set the thermostat for our heating or air conditioning system at a level we like and don’t worry about it, right? Wrong! Wrong, because you know that as soon as your back is turned, someone will come along and slowly inch up the setting until THEY are comfortable. Meanwhile, you’re taking a nap and wake up to a sweaty bed and drenched hair. The nerve of some people! So you yank off the dripping sheets and snap the thermostat back down to where YOU had set it. But your elated feelings sink as you realize it won’t be long before someone turns the unit back to their favored setting. You know that even if you go gripe at them for changing it, it won’t do any good. THEY don’t care who has to pay the bill! Would you like to end the thermostat war for good? Well, there could be at least a couple of things you could try. 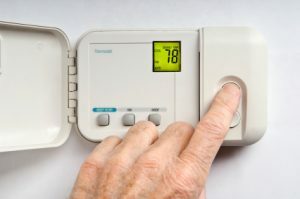 One thing that might work is getting your thermostat upgraded to a unit that allows you to schedule temperature changes, a programmable thermostat. That way, you can work out with your significant other the times of day you both compromise and the times of day or days of the week each can have their preference. For instance, if one of you works and the other doesn’t, they can have their setting programmed in for the daytime during the week while you are gone and your setting at sleep time, and during the rest of the time you compromise somewhere in between. Another thing you could do is to get a remote control for the heating and air system. Wouldn’t it be great if all you have to do was click a button instead of getting up to change it back? Today, you can even get thermostats with apps that monitor the thermostat and allow you to change it over the internet. The last thing you want is for your thermostat and air system to be constantly strained from being changed. This will only cause damage to the whole system in the end. You can stop the thermostat wars, and it will be a good thing all around. None of you want to sit in a house that isn’t thermally controlled. Talk about suffer! If your thermostat is old, out of date, or you want to find resolution to the thermostat wars going on in your household, give us a call at DeZiel Heating & Air Conditioning. We can put in a nice, new thermostat that give YOU the control for Christmas! To all our customers, may your Christmas be blessed and your holiday season filled with joy this year! If you are looking for a Furnace Repairs, then please call DeZiel Heating & A/C at 763-684-3965 or complete our online request form.